In addition to public transportation, teachers from both public and private schools and universities, bank employees, postal workers and security agents have announced a one-day walkout. SÃO PAULO, BRAZIL – Millions of Brazilians tried to find alternative means to get to work on Friday as nine labor unions called for a nationwide general strike and widespread demonstrations to protest against the social security and labor reforms being discussed in congress. Metro, buses and trains are not operating on Friday in São Paulo, disrupting the lives of more than 14 million people who use public transportation to get to work, photo internet recreation. “We are protesting against items such as the minimum retirement age, the transition rule, which ends up harming the workers who started (to work) earlier. In addition, we fight for the maintenance of wages,” union leader João Carlos Gonçalves of Força Sindical, told local news outlets. Reports of partial or total walkouts by civil servants in cities like Recife, Belo Horizonte, Natal, Curitiba and Vitoria are being reported by local media. In São Paulo, main highways leading into the city, like Rodovia Anhanguera and Rodovia Regis Bittencourt were blocked early in the morning by demonstrators. Inside the city, main roads were obstructed by protesters. Passengers trying to reach the city’s airport, Congonhas, for the start of the long Labor Day weekend were stopped by picket lines outside the main terminal. 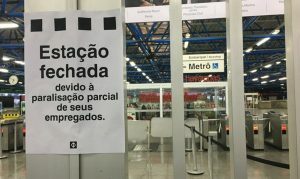 Metro, buses and trains are not operating on Friday in São Paulo, disrupting the lives of more than 14 million people who use public transportation to get to work. In Rio de Janeiro, protesters clashed with passengers trying to reach the city’s Santos Dumont airport. Ferry service linking Rio to Niteroi is irregular as protesters try to prevent passengers from entering boarding areas. In Brasilia, with roads blocked by protesters, passengers trying to catch a flight from the city’s international airport abandoned their automobiles along the roadside and walked to the terminal.